My favourite skin care products for very sensitive skins from Holland & Barrett. There’s never been a better time for home grown UK based skin care companies for the most sensitive of skins. It was almost impossible to find products back in the day that really worked on your skin unless you made your own. I know a lot about eczema and about the skin in general as i trained as a beauty therapist and also suffered skin problems for many years. I had the good fortune of being introduced to an amazing homeopath who totally removed all my allergies and eczema and even made his own very hydrating moisturizer. That’s another story for another time. If you have babies, children, parents, siblings who suffer real issues with their skins on the face and body then i would completely vote for these products. I have a very sensitive skin that itches easily and with these products i felt a sense of comfort, soothing and real hydration when applied to skin that is red, angry, extremely dry, sore and very itchy all at the same time. These products can be found in your local Holland & Barrett. PurePotions Skin Salvation Intensive Moisturizing Ointment – A complete skin saver as it comforts, soothes sore very dry skin, highly hydrating and feels soft and smooth. I really love this product and had the chance to try it out for myself. Highly recommended for Eczema & Psoriasis without a doubt. Beauty Kitchen’s Abyssinian Oil Aroma Facial Concentrate – This has to be one of the most moisturizing skin oils i have ever used on my skin. It feels and smells delicious. Just add a little bit to your daily moisturizer or night cream to add an extra boost. 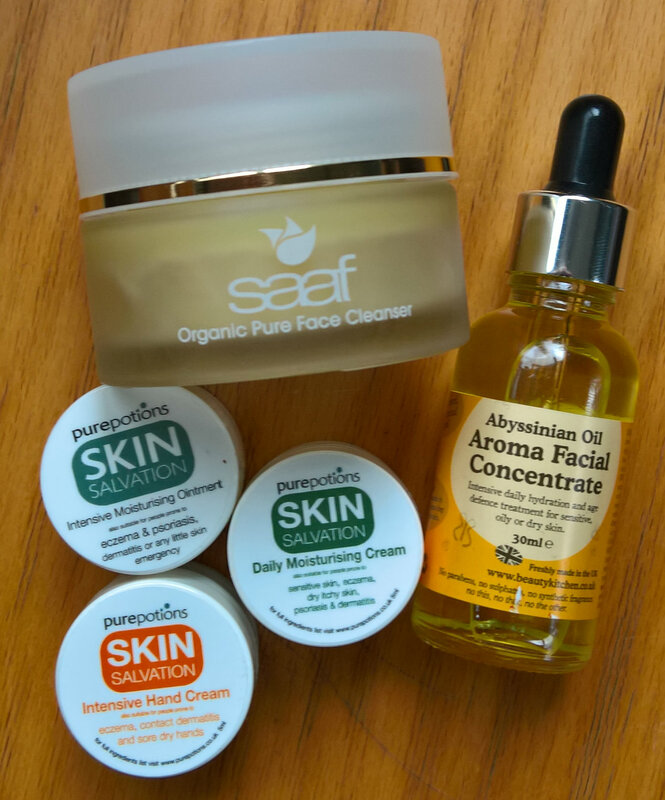 Saaf Pure Organic Skincare – I tried the Pure Face Cleanser and comes with an Organic cotton face cloth. This feels and smells absolutely delicious and would imagine the extended product range would be as comforting, protecting and moisturizing. Through my experience the creams that doctors offer will not have the same effect on skins that need a lot of tender loving care especially for babies and children. So hopefully you will choose some of these products above and try them for yourself. It’s only with trail and error that you ever make the right choices.